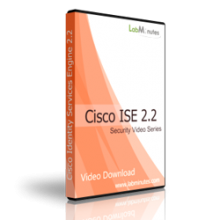 This video bundle features a complete video download set for Cisco ISE 2.2. With almost 22 hours of lab video tutorial, you will be able to get up to speed and become more familiar with the technologies. Buy this video bundle and view them locally on your computer at your own pace without internet connection, and also save over 18%. This video bundle is designed help you configure Cisco ISE from scratch on the new 2.2 version web interfaces. We cover all the basics of ISE and many commonly used scenarios so you can expect to learn and get the most out of your ISE deployment. Since we start the configuration from the beginning, no prior experience of ISE is required although we still recommend you to have basic understanding of network security technologies. Already using ISE? This video series also serves as a good refresher. Even though you may already be familiar with some of the features, we have incorporated many new ISE 2.2 enhancements in our configuration process so you can be sure to learn a few new tricks. We have also included labs on new ISE 2.2 features for you to take advantage of them. Not knowing which video to start with? We recommend you at least watch the videos SEC0267-274 to get basic knowledge of ISE. Subsequent videos can be skipped around as these labs are built with minimal dependency of one another, although we still recommend you view them sequentially if possible.